Up and to the office all the morning, and at noon with the rest, by Mr. Holy, the ironmonger’s invitation, to the Dolphin, to a venison pasty, very good, and rare at this time of the year, and thence by coach with Mr. Coventry as far as the Temple, and thence to Greatorex’s, where I staid and talked with him, and got him to mend my pocket ruler for me, and so by coach to my Lord’s lodging, where I sat with Mr. Moore by appointment, making up accounts for my Lord Sandwich, which done he and I and Capt. Ferrers and W. Howe very merry a good while in the great dining room, and so it being late and my Lord not coming in, I by coach to the Temple, and thence walked home, and so to my study to do some business, and then home and to bed. Great talk among people how some of the Fanatiques do say that the end of the world is at hand, and that next Tuesday is to be the day. Against which, whenever it shall be, good God fit us all. "Great talk among people how some of the Fanatiques do say that the end of the world is at hand, and that next Tuesday is to be the day." L&M note: "This story has not been traced elsewhere." Perhaps the Fanatiques were correct! You mean---an end to venison pasties? "Against which, whenever it shall be, good God fit us all." 1a. To be the proper size and shape for: These shoes fit me. b. To cause to be the proper size and shape: The tailor fitted the trousers by shortening them. c. To measure for proper size: She fitted me for a new jacket. 2. To be appropriate to; suit: music that fits your mood. 3. To be in conformity or agreement with: observations that fit the theory nicely. 4. To make suitable; adapt: fitted the shelves for large books. See synonyms at adapt. 5. To make ready; prepare: Specialized training fitted her for the job. 6. To equip; outfit: fit out a ship. 7. To provide a place or time for: You can't fit any more toys in the box. The doctor can fit you in today. 8. To insert or adjust so as to be properly in place: fit a handle on a door. Methinks 5. or perhaps 6. fit. He obviously does not believe it but, just in case, "God fit us all". The line between religion and superstition is still blurred and it doesn't pay to tempt the fates. ..would venison pasties be rare at this time of year? Viz. reference to pocket rulers: Has Pepys ever mentioned his pocket ruler before? What did he use it for, and why would he need it fixed? A glorious saint, a matchless Queen. The saint above, the Infanta here. Of your blest life among us here! May you as many pleasures share. "Based on John Napier's principle of the logarithm, it came into use after Edmund Gunter created a logarithmic scale in 1620. Gunter's rule consisted of a straight line on which numbers were spaced at intervals proportional to their common logarithms. 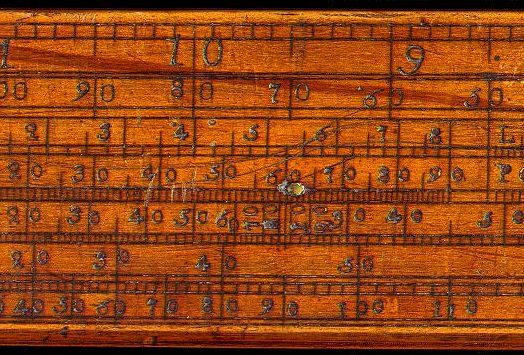 Using this scale, William Oughtred and Edmund Wingate developed independently (c.1630) the first slide rules." Unfortunately I haven't been able to find a picture of a 17th c slide rule. but it doesn' read very clearly. Here's a picture of "Napier's rods"
"and all the torments of her wheel"
Thanks for the poem Jeannine. A while ago someone-?Dirk-posted a portrait of the Countess of Castlemaine and there was some discussion about the wheel on the painting; could it be that she was paying homage to the Queen?! "Pocket ruler" other wise known as a slip stick and easier to use than log and sine tables. Normal scale rule would not be complex enough to require repairing I dothe think. A great help in dividing the number of bales of hay by the number of asses sitting on them. So if the world did end that following Tuesday, are we all figments of Samuel Pepys' dying mind? "...that the end of the world is at hand..." Repent ye sinners. "Facilis descensus Averno; sed ad auras evadere est labor"
it be easy descending in to hell, but to clime up to fresh air, it be suffering. "This story has not been traced elsewhere" ,The end be nigh, it be a popular theme when have nots see many eating Venison and they be trying to catch a mouse or two. Perhaps OT, but an interesting connection (small world). This brings to mind fond memories of "The End of the World" by Beyond the Fringe, with the cast chanting, "Now is the end.Perish the world." at the appointed hour, then silence, then a voice: "Don't worry boys, one day we'll get a winner." Didn't Sam get one when he went into Epping Forest to learn about measuring timber? He then used it to measure the tables in the pub so delighted was he in his new skill. "....and fit us for heaven to live with thee there." From the popular carol "Away In A Manger". A recent PBS special about another famous man of the times, Sir Isaac Newton shared his private notes which show his prediction for the end of the world to be 2060. So in keeping with the Restoration theme of the times any sinners amongst us should go through a thorough conversion, perhaps a dramatic one ~~a la Charles II type perhaps ~~ somewhere around 2059 just to be on the safe side. I'm no expert on death bed conversions but it probably would be a good idea, and much more convincing of ones friends and family, if the conversion took place a little time before the actual end of the world so it had a hint of sincerity in it. If I live till then I'll be 109 and ready for the End! venison pasties rare this time of year? There were no refrigerators or freezers and I suppose it has something to do with the time that deer were hunted. I would guess that, being fall, the hunting season had only just begun. Aus. Sue is right. Another pocket ruler use, it may be, is estimating height. I have seen folding rulers that have a catch built into the hinge to allow the legs to be held at right angles. Didn't Sandwich use something like that to estimate the height of the cliffs of Dover recently? And our man of many names linked to a learned book by Capt. John Smith telling how to do it. Pocket Ruler, were it a boxwood scale 36" long folded up into a 6" strip [using luverly brass hinges and brass screws] used for measuring his yardage in 1/8 of inches?, or be it a Pepis 4 banger version of a slip stick [made of walrus bone]used to help with multiplication and dividing. Reading the file by Pepys on Great o rex. Pepys loved to visit him [12 times] and get the latest on his inventions and ideas on Maths. 3]"where I bought of him a drawing-pen; and he did show me the manner of the lamp-glasses, which carry the light a great way, good to read in bed by, and I intend to have one of them"
"He recommended Bond, of our end of the town, to teach me to measure timber, and some other things that I would learn, in order to my office. " This Gentleman made many devices for calculating , and simple slide rule would be perfect for X & '/. When I be involved in higher maths of using numbers higher than 7 x 7, the Circular slide rule be perfect to run numbers above 4 places, until I was provided with the latest version of Samuel Morlands calculating device that took couple of centuries to get into production and 3 years salary. Love the idea it be a simple ruler but it be a bit too simple for him to be involved with a tradesman too, although he could have passed it on to an apprentice and told to fix this, as a curtesy to Sam. "So if the world did end that following Tuesday, are we all figments of Samuel Pepys’ dying mind?" At one point, Newton concluded that his theological works (and who reads those, nowadays?) were of far greater importance than his mathematical works and contemplating destroying all his mathematical writings, which he was, at that time, regarding as a dangerous self-indulgence and possibly inspired by Satan. Fortunately, he did not do this. The great date for the end of time was 1666, because of it being 1000 + 666 (mark of the Beast from the Book of Revelation). So we will have much more of this repent before it's too late mutterings further along. This is the first time that Sam seems to experience just a twinge of unease about this. Shows how rumour ran about waving its information infectiously. A.D.A., in previous discussion (somewhere) of Elizabeth's portrait by Lely, she too is depicted with the attributes of St. Catherine, the palm and the wheel; and it was considered an allusion to and a compliment to the Queen. Still plenty of fanatiques about waiting for the end times to come any time now. things from the vicarage to [his] own house on the green in earnest [praying,] lord you that knows the names, dwelling occupations of yours. Know me and mine and dwell with us I pray thee, and let our habitation, be a dwelling of peace and righteousness” -- as though he were about to be left behind. It's very difficult to sort out, isn't it? I wondered if "next Tuesday is to be the day" wasn't said in the very manner it might be said today--grounding this fanaticism in the mundane of checking the calendar to see what is "on" next Tuesday. I, personally, found humor in " whenever it shall be, good God fit us all"--if "they" are determined that this it is, I invoke protection for us all. I don't think Sam is invoking God flippantly here - he was serious about God - just not fanatical. "But about that day,or hour, no one knows, neither the angels in heaven, nor the Son, but only the Father. Beware, keep alert, for you do not know when the time will come." Although Sam would not have had this as a text for the Sunday just gone (the 1662 BCP Tables of readings differ), he would have traditionally had in Advent sermons on the "Last Things" - Judgement, Hell, Redemption, Apocalypse. Heavy stuff. Well, we'll know next Tuesday. They could be rare at this time of year because the rut is just coming to an end; therefore the stags are thin and worn out with the previous weeks' exertions and the hinds are, everyone hopes, pregnant and therefore not fair game. The fleet under De Ruyter sailed from Algiers after friendly meeting with Lawson. He had called on board De Ruyter's ship to present his compliments. I suggest avoiding Pedro's "failed" link above, it seems to have been captured by a NSFW site, yikes. "where I staid and talked with him, and got him to mend my pocket ruler for me"
At Bushy Park in south west London the wild deer herds are culled every September and November. These deer have no natural predators in the royal parks, nor are they hunted, so their numbers would become unsustainable without management through the culls. Assuming that the parks managers know what they're doing, we can perhaps assume that this is a good time to either hunt or cull deer herds. Therefore at this time of year venison would be both plentiful and fresh. Furthermore, the BBC 'Food in Season' section confirms that venison is in season in November. Could Sam have meant 'rare' in the sense of 'unusually good'? Or, perhaps more of a stretch, given that the meat would be fresh perhaps it would be cooked 'rare' rather than 'well done'? Pedro's link is-- shall we say---- naught active? Easy to laugh at the Fanatiques but every age has them. No less today. ‘fit v. . . III. trans. To make fit. . . 6. b. To render (a person) competent or qualified. Const. as above. . . 1647 J. Trapp Mellificium Theol. in Comm. Epist. & Rev. 681 Such as fits a man for some particular calling.